A Mold Inspection can reveal hidden mold conditions. The worst mold is the mold you don’t see, lurking under carpets, spreading unnoticed inside walls and deep inside heating and air conditioning vents. "I don't SEE any mold!" 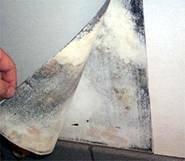 Half of the people who call us don't see any visible mold in their home or office, but they have a reason to suspect a mold problem. Unfortunately, not all mold problems are as obvious as we would like them to be. In fact, the most costly mold related repairs are caused by mold that no one knew was there. 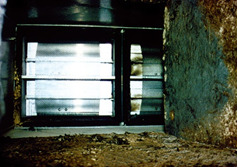 Unnoticed, mold can rapidly spread exponentially inside walls, under floors, above ceilings and deep into heating and air conditioning vents. By the time hidden mold is detected, it can cause thousands of dollars in property damage. If you suspect you have a mold problem, don't wait until you can visually see it. If you smell musty odors or become aware that your property has experienced a flood or plumbing leak in the past, it is a good idea to have a professional mold inspection performed. Prompt action can mean the difference between a repair project costing a few dollars or several thousands of dollars. Below is an example of how hidden mold in a bathroom can cause damage long before it becomes visible. The following photos of a one year old home were taken by a PrimeAire Certified Mold Inspector. Though no visible evidence of mold was present, using state-of-the-art moisture detection equipment, the inspector was able to detect high moisture retention in the drywall, baseboard and shower tiles. Moisture is always the cause of mold. Further inspection revealed extensive mold growth on the wall, inside the wall, on the baseboard, under the carpet, and into the sub-floor. Because this was a second floor bathroom, it also caused water damage and mold growth inside the kitchen ceiling below. Assuming water was leaking from the door frame, the homeowner tried to caulk it with silicone. However, the leak was caused by a defective door gasket on the bottom of the door which was allowing water to pass through onto the floor. In addition to the extensive property damage that occurred, an air test revealed highly concentrated airborne levels of Stachybotrys, Ulocladium, Chaetomium, Penicillium and Aspergillus. 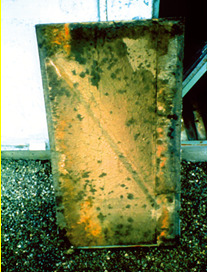 In this example, the homeowner knew "something" was wrong long before consulting an inspector. They had been sopping up water from the carpet for several months and noticed the smell of mold getting stronger as time passed. 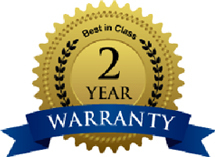 By not acting promptly, the water damage and mold growth became significant. Most of us already have two effective mold detectors – our eyes and our nose. Like the old adage goes, "If it smells like mold, it's probably mold!" And any time an unexplained discoloration appears on a surface, especially if the location is or was damp, it is almost certainly mold. You may not know what type it is or how extensive the problem may be, but you know you have a mold problem, and it won't just go away by itself. • If you find yourself clearing your throat a lot, getting unexplained headaches, eye and nose irritations, or having cold or flu-like symptoms. • If you find yourself having pet-like allergies but you don't have a pet. • If you feel sick in a particular location (e.g., home or work) but not sick after you leave that location. 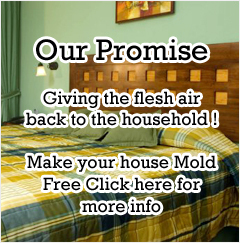 • If you suspect you have a mold problem but you're not sure, contact PrimeAire today. 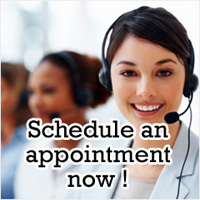 A qualified specialist will listen to your concerns and help determine whether or not mold might be a factor. The main objective is to be pro-active. The most dangerous mold is the mold you don’t see. Hidden mold can create significant damage to your property and risks to your health long before you know it's there. A persistent small trace of mold in the grout was a symptom of a much larger mold behind the tub and shower tiles. Wall paper and decorative stickers are favorites of mold. If you see bubbles, dark stains or lifting, look closer. Pictures and plaques on walls that back up to bathrooms or exterior walls provide a good environment for mold growth. Exterior walls absorb moisture from sprinklers, rain and standing water causing high moisture retention in wall cavities.